Merritt Academy is proud to be recognized as a National School of Character by the Character Education Partner- ship, a national non-profit coalition based in Washington, D.C. This prestigious honor is awarded to a handful of public and private schools across the country in recognition of outstanding programs that encourage the social, ethical and academic development of students through character education. Character education is most effective when it is spread throughout regular school courses. At Merritt Academy students are engaged in hands-on activities where good character is emphasized throughout the school day as well as through our character education curriculum. 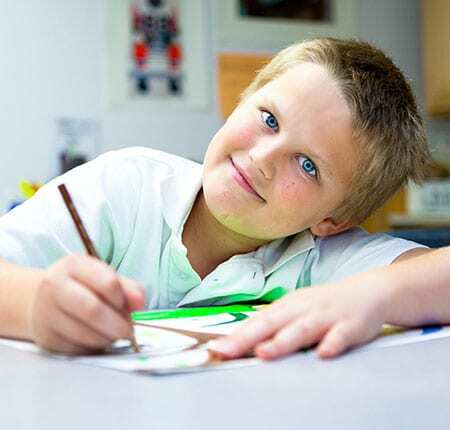 Our extensive character education program covers many subject areas related to character. Children in each age level study developmentally appropriate and challenging topics in the subject areas below. Merritt Academy’s Seniors and Students Together Intergenerational program was established in fall of 1991 with the purpose of bringing together students and senior to form an integrated group promoting the mutual sharing of skills and experiences. The goal of the intergenerational program was to foster interaction and socialization between the generations, thus improving the quality of life for both groups. All Merritt Academy students, infants – 8th graders, participate in the Intergenerational Program visiting six different assisted living communities throughout the Northern Virginia area. Our students enjoy spending time with their grandfriends, particularly learning about their past personal experiences. The children are often fascinated as they learn about how the world was different, and what it was like to be a child in an earlier time. The children breathe happiness and life into the senior communities, sharing their lives and experiences with their special friends. It is a mutually beneficial relationship, as the seniors are reinvigorated by the innocence and joy of the visiting children, while the children learn respect, patience and helpfulness.